There is little research on Southeast Asian Cobras in their native habitat. In fact most of studies of cobras in situ came from Africa. Naja angulifera was recognized as an important species in southern Africa. Common in south eastern Nigeria Spitting Cobra Naja nigricollis and the Black Forest Cobra, Naja melanoleuca, differed significantly in terms of habitat types used. Forest Cobra Naja melanoleuca inhabited mainly primary and secondary forest patches, when Naja nigricollis did not connect with any macrohabitat categories. Cobras are primarily terrestrial, however, they also enter water and climb trees in search of food. Pseudo hajegoldii is highly arboreal snake from west and central Africa. This species is poorly studied and not much is known about its field ecology. African cobras prey on a wide variety of prey items including amphibians, reptiles, mammals and birds. There is even a record of an adult Naja annulifera feeding on two tortoises. Scavenging of road-killed snakes had been observed in Naja nivea and Naja nigricollis woodi in Africa. Opportunistic predation on a snake injured by a motor vehicle was observed in Botswana. In Southeast Asia Cobras have been recorded as preying on other snake species, frogs, lizards, birds, and small mammals. The occasional appearance of fish in the diet been observed in India and Thailand. Naja sputatrix on the island of Java consumes mostly mammals. Cobras are found in both deep forest and rural areas around Sakaerat Biosphere Reserve (SBR), Nakhon Ratchasima province, Thailand. Cobras can be found in the fields, especially rice paddies and their margins, and around human households where they forage for prey items. In both situations snakes have negative interactions with humans which are dangerous for both, humans and snakes. Both species of Cobras are listed on appendix II of CITES. Naja siamensis is listed as vulnerable on the IUCN red list and species Naja kaouthia is listed as a species of least concern. Both species appear to be in decline throughout their geographical range. Despite their conservation status no conservation work is being conducted at the moment. This is relatively young species, redescripted in 1997 by Wurster. Indochinese Spiting Cobra is smaller than Monocled Cobra and reaches 1.6 m at maximum. The coloration and pattern are highly variable and depend on geographical location. Specimens from the north and northeast Thailand tend to be uniformly brown or greenish dorsally. That is true also for SBR. Specimens from central Thailand may be completely black or black and white and with or without speckling or cross banding. Hood markings varies and are “V” or “U” or “H” -shaped or often spectacle shaped. However, the hood markings may be faint or absenent. This snake is primarily terrestrial. It feeds on variety of animals including other snakes, frogs, mammals and birds. It is commonly found in agricultural areas. 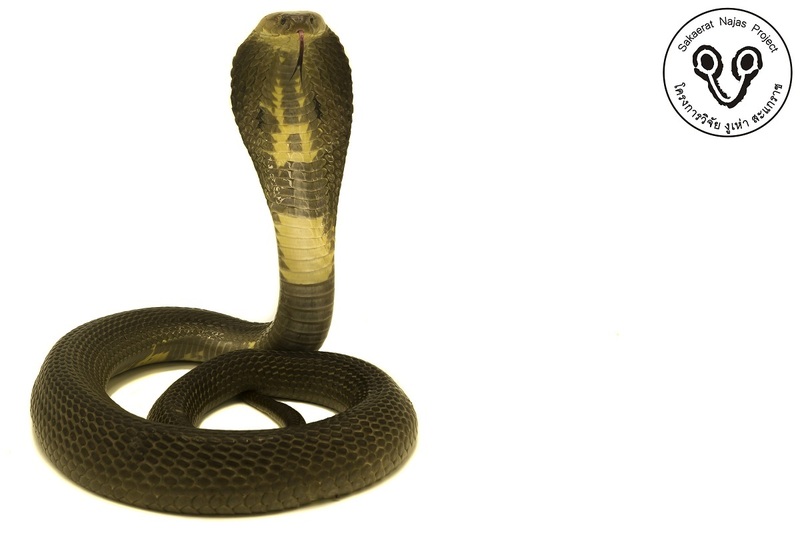 It can spit accurately venom in aggressors eyes form 2 m. Once venom enters the antagonist’s eyes it causes intense pain. Venom should be flush out from eyes with big amount of water. 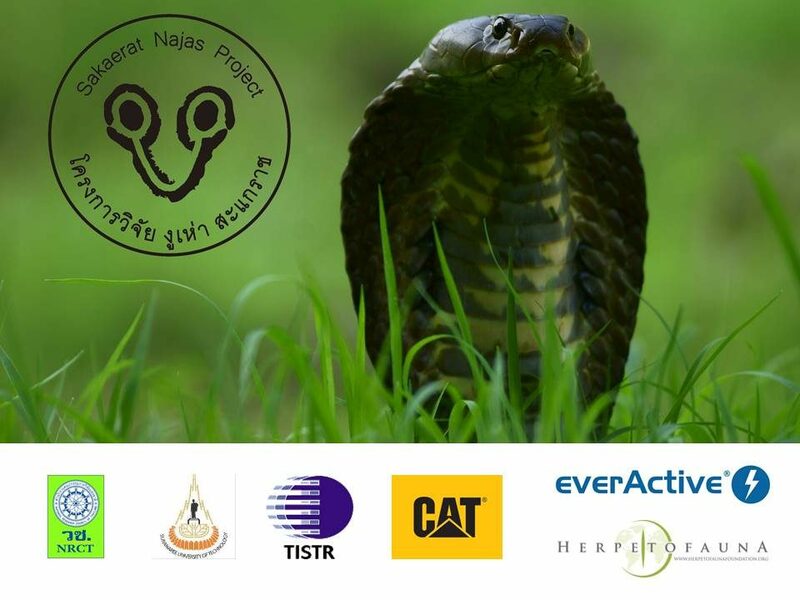 Naja siamensis can be found threw Cambodia, Laos, Vietnam and Thailand. The LD50 of its venom is 1.07-1.42 mg/gram of mouse body weight. The Monocled Cobra is large species of elapid. It is found in Bangladesh, Bhutan, Cambodia, China, India, Laos, Thailand, West Malaysia, Myanmar, Nepal, and Vietnam. Adult males can grow up to 2.3 m length and weight up to 1.8 kg. The head is barely distinct from the neck and they have a cylindrical body. The coloration and pattern are variable, the dorsal surface may be yellow, brown, grey, or blackish and with or without ragged or clearly defined cross bands. Specimen found in SBR are mostly dark or black with the classic monocle mark on their hood. Snakes reach maturity in their third year of age and their clutch size ranges from 12-45 eggs. Most literature states that this is non spitting species, but I have observed this behaviour on two occasions. In SBR Monocled Cobras are found in deep forest, around research station as well as in the villages. The median lethal dose (LD50) of its venom is 0.28-0.33 mg/g of mouse body weight.